Whisper it to the friends whose birthdays I’ve forgotten this year, but I had a reminder set in my phone for September 18th 2018 as soon as I heard that this would be the publication date for J. K. Rowling’s fourth Cormoran Strike novel Lethal White. I had plans to buy it shortly after midnight to read on my Kobo while doing a late night feed with the baby. Those plans with scuppered by a trip to accident and emergency with a toddler sporting a 40 degree fever (she’s fine, she wanted me to take her to the museum when we were leaving the hospital at half past two in the morning) and the kobo store not having made it available until the next day. Still, the nights are long when sitting up watching a toddler for signs that her temperature is getting higher again, so I soon managed to catch up with Cormoran Strike and Robin Ellacot where Career of Evil left off, on Robin and Matthew’s wedding day. I’m not sure whether it was my state of mind while reading it, but for me, Lethal White, which sees Rowling take on the personal lives of the upper classes and characters across the political spectrum, felt a little more strained than the other books in the Strike series. Rowling’s social commentary remains sharp but at times the verbosity which has seemed natural in other books in the Strike series felt a little stilted, and for me, Lethal White was lacking the easy humour which balanced out the darker elements of previous Strike books. It’s difficult to say how much of this was due to the need to cover the narrative arc of Strike and Robin’s personal lives in more detail while also bringing together the various threads of a murder mystery, and how much of the strain was due to JKR admitting in her acknowledgements that she’d taken a lot on in writing this book while working on various Harry Potter stage and screen spin offs. Either way, Rowling/Galbraith’s sleight of hand lacked the usual lightness of touch I’ve come to expect from the Strike novels, the misdirection less effective with the red herrings that were laid out to distract proving ineffective in leaving me wondering whodunit until the end of the novel. Is anyone else expecting the next novel in the series to feature another personal vendetta type crime as with Career of Evil? Am I being cruel to think that Lethal White might be a victim of the success of the BBC TV series Strike? It felt as though a lot of the scenes were writing as staging directions outlining how Rowling saw the scenes being shot. This entry was posted in Book Reviews and tagged books, Cormoran Strike, Crime Fiction, entertainment, JK Rowling on September 20, 2018 by Siobhan. JK Rowling/Robert Galbraith, so what? 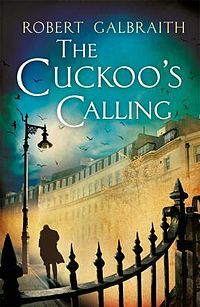 If you’ve been on twitter, news websites or watching television this week, you’ve probably already heard that JK Rowling has released a well-received crime novel called The Cuckoo’s Calling under the pseudonym Robert Galbraith. As a pseudonym, it bears all the hallmarks of JK Rowling’s characters’ names reflecting their traits and means Famous Stranger. Well played, JK Rowling, very well played. But why all the fuss about her writing under a pseudonym? I can completely understand that with such wild success under her belt she would want to see how her work was received by readers who weren’t prejudiced by their opinions of her previous work. (See statement from JK Rowling on Galbraith here). I mean, show me a review of The Casual Vacancy that doesn’t mention, if not compare it, to the Harry Potter books. Even I was annoyed by the reviews that complained it was a departure from the wonderful world of Hogwarts and its inhabitants. Imagine how she must have felt. Still, while I could understand excitement at JK Rowling releasing a new book (who doesn’t love a new book from one of their favourite authors) I feel that there has been a hell of a lot of negativity and that it mostly seems to stem from the fact that JK Rowling is so successful. Suggestions that it was all just a publicity stunt. Maybe it was a marketing ploy, the way it was discovered is a little fishy, but I still think that it’s pretty cool that she did it. As I’ve said, it must have been nice to have her writing appreciated without her name being considered. Let’s face it, publicity stunt or not, it’s not like any book by JK Rowling is at risk of going under the radar. But it does serve to highlight that writing isn’t a get rich quick scheme and even if you are lucky enough to get published what a fickle world it can be. Industry experts like Jonny Geller of Curtis Brown have pointed out on Twitter that until the news broke, the well-reviewed Galbraith novel had sold 449 copies since April. This gives you an idea of why new talent is such a big risk for publishers- they take an awful lot of effort to market when compared to an established name. People complaining that she felt that she had to use a man’s name as though she’s a gender traitor. Some have said that this allowed her to conceal her identity more effectively, but honestly? It’s just an example of sexism in literature. Male names sell better than women’s names in Crime Fiction. This is why she was told to use her initials rather than Joanne Rowling as a name when she released Harry Potter- because boys don’t like reading books by girls. Pathetic yes, but when did you last pick up a Romance book with a man’s name on the cover? There are plenty of men writing for Mills and Boon, they just use female pseudonyms. Yes it’s sexist. But JK Rowling has done enough to prove that women can right, it’s the attitude of publishers AND the reading public that needs to change here. Saying it’s all about the money. JK Rowling is allegedly the first billionaire to give away enough money to charity to lose billionaire status. And while it is, admittedly, all relative, it’s annoying to see people giving her a hard time for being successful. Some of the nastier jibes about this have come from agents and publishers on twitter (eg. this tweet from Melville House, below). I wonder if they have a policy of rejecting clients and authors who they deem to be too successful? If so, send them my way. I’m not so fussy. So, when The Cuckoo’s Calling is out in paperback, I will be reading it. In the meantime I will continue to read a mixture of established authors and new authors, but to be honest, I’ll be more interested in the content of the book than the name on the cover. This entry was posted in Uncategorized and tagged books, entertainment, JK Rowling, news, reading on July 15, 2013 by Siobhan.